The Fender Mustang 90 PF Electric Guitar harks back to the original's character, resurrecting the spirit of mid-60s' non-conformity that made it such a beloved model. Designed with students in mind, it was rapidly adopted by garage rock bands and free spirits who wanted a no-nonsense, all-out workhorse that produced raw tones. 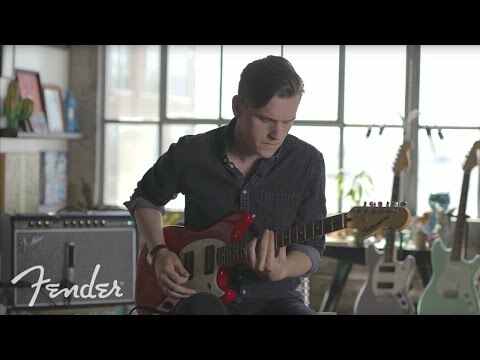 The Fender Mustang 90 still has that recognisable, unique shape that came about when Fender gave some of their student guitars a remake in the 1960s. This classic model has a short-scale body that makes it much easier to play, whether you're a younger guitarist or simply prefer a shorter reach during hectic live performances. The Mustang 90 features a solid alder body which is then treated with a gloss polyester finish. Alder has the enviable quality of producing a delicately balanced tone, which errs slightly towards a midrange punchiness. A maple neck is joined to the short-scale Mustang body, shaped to the comfortable "C" profile. The neck is given a satin polyurethane finish for a slicker feel in your hand. Aboard the neck is a smooth pau ferro fingerboard that provides a luxurious playing surface. There are 22 medium jumbo frets at your service, which are adorned with white dot inlays to guide your way in understated finish. The 9.5-inch fingerboard radius is perfect for laying down smooth string bends, tearing through lightning fast legato licks, and maximising playing comfort. Fitted to the body is a pair of Mustang MP-90 pickups, which produces heady combination of thick and chunky single-coil tones that can slip over to a tight and punchy sonic assault. Whether you're picking out deft single note arpeggios, laying down a huge wall of sound, or simply chopping into power chords like your life depends on it, the MP-90s respond just as you'd expect - enthusiastically! Simple controls feature for Master Volume and Tone, while a 3-way pickup toggle switch allows you to shape the sound output to suit your playing needs. The lower bout of the Mustang 90 is fitted with a 6-saddle strings-through-body Strat hardtail bridge with bent steel saddles, improving sustain and tone. The bridge also works simultaneously alongside the Standard Cast / Sealed tuning machines at the headstock to ensure total tuning accuracy. The finish of the Mustang 90 is accompanied by a 4-ply Aged White Pearloid pickguard as a protective yet attractive addition to the body. The Fender Mustang 90 PF Electric Guitar is a stunning twist on a classic instrument.